The material CARBO 13 allows operating temperatures of up to 400°C, giving a good resistance to high temperatures. Thanks to its dark, wear-resistant and heat-absorbing surface an optimum utilisation of energy is achieved. Excellent stability of shape over an extended period of time and the precise running qualities are characteristic of a belt that provides a reliable surface for processing bread and pastries. In addition, the belts, available from Heat and Control , meet the highest hygiene standards. 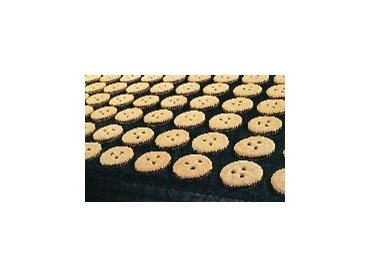 For special applications, Berndorf offers bake oven belts featuring retaining strips. Conveniently, in the production of bread, for example, the main stage of fermentation of the bread loaves and the baking may be done in a single process on the same belt. The shape of the retaining strip guarantees smooth return via the drums. The retaining strip is made out of silicone rubber and is applicable in operating temperatures of up to over 200°C.